As a natural stone of volcanic origin, pumice's healing properties have been prized by healers since ancient times. Today medical cosmetology recommends the use of natural pumice for exfoliating the skin, giving your body health and beauty. Color, size, and texture will vary from stone to stone due to the natural formation of pumice. 1. Soak your feet or other area of callused skin in warm water, optionally adding sea salt or 1-2 drops of Lavender or Jasmine essential oil. 2. Dampen the pumice stone in the same water for ease of use. 3. For the heels, palms, and feet, gently rub the pumice stone in soft circular motion. 4. After cleansing, rinse your body with cool water. 5. Apply a soothing lotion. - For hygienic purposes, do not share previously used pumice stones with others. - Do not use on delicate, soft skin or on inflamed, red skin. - Do not scrub skin with a pumice stone. - For preventive maintenance, two times per week is sufficient. - After use, thoroughly rinse the pumice stone with soap and water. - Allow it to dry. - Replace your pumice stone if it's showing signs of wear and tear. If you add to your cart and buy now, you will receive your pumice stone in a few days and you can start enjoying its benefits. NATURAL WHITE PUMICE STONE - White colored pumice stones contain many different natural elements, like silicon, which give the stones their unique color. Our white pumice stones have a very fine grit and are ideal for polishing soft, small calluses. We also recommend using our white pumice stones as a final buff after using our larger grit brown or black pumice stones. PUMICE STONES are an effective and reliable tool for rejuvenating and cleansing the skin of the hands, feet, elbows, and heels, and for removing calluses and corns, hardness, dryness, and rough or dead skin. PERFECT SHAPE AND SIZE - Easy and comfortable to hold in your hand - Natural rope that holds its shape well after getting wet. GIVE THE GIFT OF HEALTH - Pumice stone is the perfect gift for your loved ones. It is the most natural method of softening rough skin. Treat your friends and family to the gift of youthful, healthy skin for many years to come. 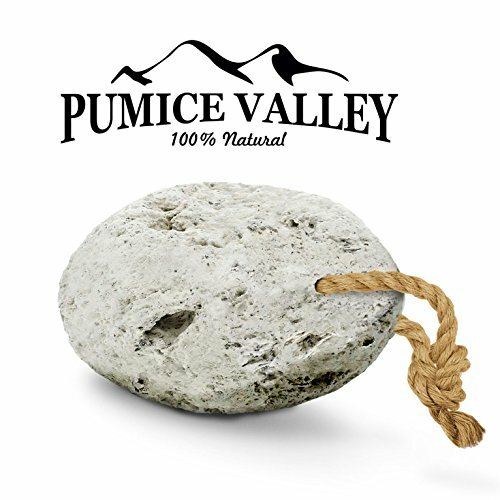 If you have any questions about this product by Pumice Valley, contact us by completing and submitting the form below. If you are looking for a specif part number, please include it with your message.